This modern A-line wedding dress by designer Stella York was made for the bombshell bride. Lace, tulle and regency organza create a silhouette that fits through the bodice and flares in a dramatic fashion just below the hips.While the sweetheart neckline plunges in the front, the back of this modern A-line comes in traditional lace-up or with a zipper closure under fabric-covered buttons. Graphic floral lace mixes with ornate French lace, giving this wedding dress an extra ‘pop’. The long tulle train is delicately adorned with lace that starts high on the silhouette to give an exciting exit down the aisle. 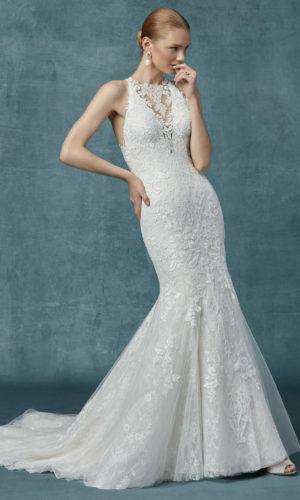 While the sweetheart neckline plunges in the front, the back of this modern A-line traditionally laces up in the back.